Thurl Lee Bailey was born in Washington, D.C. on 7 April 1961. He is a graduate of Bladensburg High School in Bladensburg, Maryland. Family is extremely important to Bailey. He is a devoted family man with six children. He and his wife Sindi currently live in Salt Lake City, Utah with their three youngest children. He also has a daughter with his college sweetheart and two sons from a previous marriage. Bailey leads a full purposeful life as a public speaker, a broadcast analyst for the Utah Jazz and the University of Utah, an actor, and a singer/song writer. His music repertoire includes Faith in Your Heart (1998), The Gift of Christmas (2001), and I’m Not the Same (2002). His music is a potpourri of uplifting songs with a balanced mixture of R&B and Nu Soul. In addition to his music career, he has also appeared in a few films. Bailey is a retired professional American basketball player who was blessed with 16 successful years of playing professional basketball, from 1983 to 1999, of which 12 of those years were spent playing with the NBA. During his career he played for both the Utah Jazz and the Minnesota Timberwolves. He attended North Carolina State University and was instrumental in leading the Wolfpacks to the 1983 NCAA Championship. Under the direction of head coach, Jim Valvano, Bailey led the Wolfpack in both scoring and rebounding. During the 1983 NBA Draft, the Utah Jazz selected him as the 7th pick. Utah Jazz management would later comment that they chose Bailey not only for the quality of his game, but also for the quality of his character. He was traded by the Utah Jazz to the Minnesota Timberwolves on 25 November 1991. He played for the Timberwolves for almost three seasons. In 1994 he left the NBA and played in the Greek League (playing for Panionios) for the 1994-95 season. From 1995 to 1998 he played in the Italian League. He played for Polti Cantù from 1995 to 1997, and Stefanel Milano from 1997 to 1998. On 21 January 1999 he returned to the Utah Jazz as a free agent. He officially retired from the sport of basketball after the 1998-99 season. Standing at 6 feet 11 inches tall, and weighing in at 247 pounds, Bailey is a giant of a man, not only in stature, but also in heart. Throughout his entire career he has been actively involved in community service. Since 1984 he has been the director of basketball camps for youth in which he not only teaches basketball skills, but he also uses basketball to help teach the youth valuable life lessons. His camps often focus on youth with severe illnesses, or youth who come from ill-fated backgrounds. Those youth participating in the camps are admitted free of charge thanks to Bailey’s foundation called Big TLC which helps raise money for various charities and organizations, including his own basketball camps. He enlists the aid of various charities and organizations throughout the community to help identify those youth who would most benefit from the camp and then admits those who cannot afford to attend for free. Bailey also participates in school read-to-achieve programs, and gives motivational talks at schools throughout the state of Utah and beyond. In addition he works with various charities — Make-A-Wish, DARE, and the Happy Factory, to name but a few. Because of his kindness and generosity, Bailey has been recognized by numerous awards for his leadership and contributions to the community. Awards which he has received include: the NBA’s prestigious Kennedy Community Award, the Utah Association for Gifted Children’s Community Service Award, Sigma Gamma Chi fraternity’s Exemplary Manhood Award, the Great Salt Lake Council of the Boy Scouts of America’s American Champion Award and the Italian League’s 1998 All Star Games Most Valuable Player award. Bailey first learned about The Church of Jesus Christ of Latter-day Saints (inadvertently referred to as the Mormon Church by the media and others) in 1983 when he was drafted by the Utah Jazz. During his time in Utah, it is reported that he received some 57 copies of the Book of Mormon from friends and fans, but took no real interest in the Mormon faith until he met his wife Sindi who was already a member of the LDS Church. He was playing basketball in Europe, in Italy, at the time, and mentioned to Sindi that he was interested in learning more about the LDS Church. The Ward Mission Leader of the Ward where Sindi was attending at that time sent missionaries to Bailey’s house to teach him about the gospel. He was baptized by his father-in-law in Milan, Italy in 1995 and later stated that it was one of the best moments in his life. 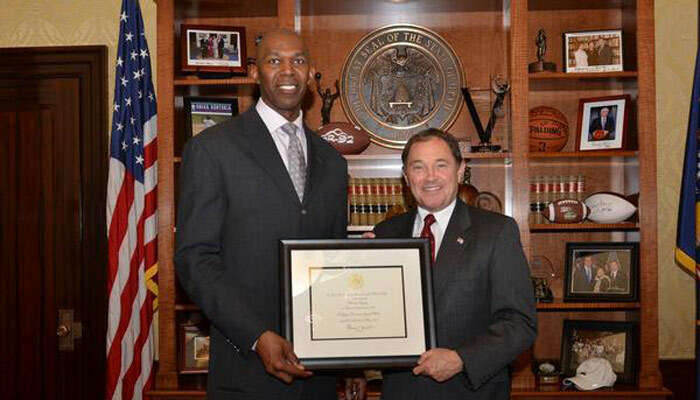 On Monday, 20 May 2013, Governor Gary R. Herbert of Utah named Thurl Bailey as his ambassador to the state’s refugee community. As ambassador, Bailey will function as a liaison between the Governor’s office and the over 50,000 refugees in the state from countries such as Iraq, Burma, Somalia, and Bhutan who live in communities of approximately 5,000 each and now consider Utah to be their home. Thurl has demonstrated exceptional character and passion, both on and off the court,” Governor Herbert said. “His advocacy on behalf of Utah’s refugees will be extremely beneficial as we continue to help them integrate into our communities, and enhance the fabric of our great state and unique quality of life. The Utah Jazz drafted Thurl in 1983 as the 7th pick of the draft. 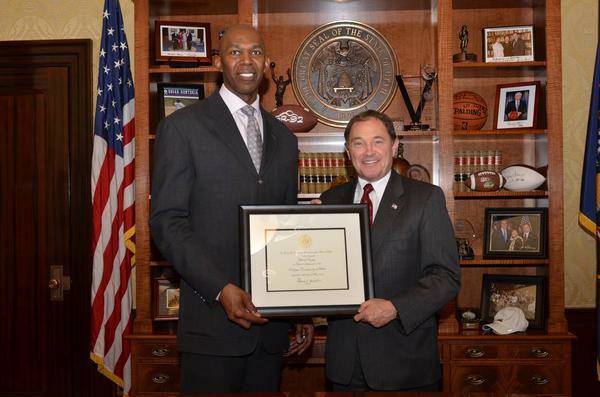 Former Utah Jazz basketball player Thurl Bailey is a member of The Church of Jesus Christ of Latter-day Saints. He is eager to clear up misconceptions about his newfound faith. When he arrived in Utah 19 years ago, Bailey was like most visitors–he was smitten by the scenic beauty and stumped by the predominant religion. After giving a speech at a school or attending a social function, people would hand him a gift, often the Book of Mormon. He collected 57 copies. Occasionally, he’d thumb through the pages, curious but not serious about Mormonism. His conversion would come later, after he met and married a member of the Church named Sindi. He calls his baptism in 1995 one of the best moments of his life. Thurl Bailey attended North Carolina State University and was a key player in the Wolfpack’s miracle run to the 1983 NCAA Championship. That same year, under head coach Jim Valvano, he led the Wolfpack in both scoring and rebounds. The Utah Jazz selected him as the seventh overall pick of the 1983 NBA Draft. Jazz management reported that he was selected for the quality of his character, as well as for the quality of his game. This was the beginning of 16 years of playing professional basketball. Twelve of those years were in the NBA, with another four years playing overseas. In 1998, he was the Most Valuable Player of the Italian League’s All Star Game. Thurl joined the LDS Church in 1995, and he has shared his story at many firesides and devotionals. When he arrived in Utah two decades ago, Thurl was like most visitors—he was smitten by the scenic beauty and stumped by the predominant religion. After giving a speech at a school or attending a social function, people would hand him a gift, often the Book of Mormon. He collected 57 copies. Occasionally, he’d thumb through the pages, a bit curious but not serious about Mormonism. His conversion would come later, after he met and married his wife Sindi, a member of the Church. Thurl calls his baptism one of the best moments of his life. His strong sense of service has led to countless hours of volunteer work and to numerous awards for leadership and contributions to the community. Included in his awards are: the NBA’s prestigious Kennedy Community Award, the Utah Association for Gifted Children’s Community Service Award, Sigma Gamma Chi fraternity’s Exemplary Manhood Award, and the American Champion Award from the Great Salt Lake Council of the Boy Scouts of America. He has directed basketball camps for youth since 1984, where he teaches young people lessons about life and basketball. Many of his students have special needs, such as coming from disadvantaged backgrounds or having serious illnesses, and they attend the camps on scholarship. Thurl is also known for his singing ability and his love of music.He has released three gospel-oriented CDs that have sold well. In 2000, he won Pearl Awards for Best Contemporary Recording and Best New Artist of the Year. Thurl, Sindi, and their children reside in Salt Lake City, where he is currently a TV analyst for Utah Jazz and University of Utah basketball broadcasts. He also continues to fulfill a steady schedule of speaking engagements. 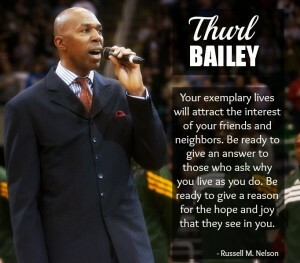 Learn more about Thurl at www.thurlbailey.com.